The internet is both titillated and enraged (pretty standard for the internet, actually) over the video of an angelic young soccer player nearly decapitating her opponent via ponytail yanking. But does she deserve your scorn or your pity? 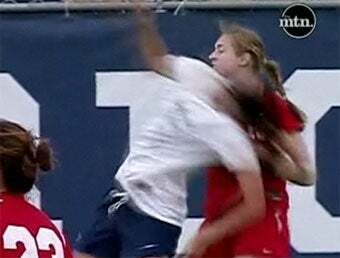 BYU and New Mexico had one of the only the chippiest women&apos;s soccer games you&apos;ll ever see. Junior Elizabeth Lambert is the Loco Lobo who cameras caught bringing the pain down on BYU in the Mountain West women's soccer semifinals. She kicked, she punched, she clawed, she yanked and basically slugged her way to global infamy. Not since Zinedine Zidane has the world cared so much about soccer players hurting each other. We already have the apologies and recriminations—Lambert has been suspended indefinitely by her school—and there's sure to be more handwringing and "WHY ARE OUR LITTLE GIRLS SO OUT OF CONTROL?" editorials, but I suspect that Lambert will get far more grief than she probably deserves. I admit that I'm not a soccer expert, but it seems that she isn't any dirtier than most footballers—just more obvious. You'll notice that in some of the instances, Lambert is retaliating for chippy play from the Cougars. It was grossly out of proportion retaliation, but retaliation nonetheless. A Cougar throws an elbow, Lambert throws a punch to the shoulder blades. Another pulls her shorts, she pulls her hair. Another steps on her foot, she sends one of their guys to the morgue. That's the New Mexico way. And you'll also notice that despite all these apparent infractions, all Lambert received was one measly yellow card. The point is that these kinds of "dirty" tactics (elbows, jersey pulling, tripping) are all part of how soccer is played. It's just that its usually a lot more subtle. Clearly she crossed the line, but maybe the problem isn't that Lambert is a rageaholic thug, it's that she just isn't very good at soccer. A more accomplished player would have found a way to de-cleat her tormentors without drawing so much attention to herself. Unlike the usually reliable Zidane, who instead chose to take his revenge during the final minutes of the most important and most watched soccer match imaginable. Yes, girls play dirty too. I know this is shocking to everyone, but not if you've ever been to a casino with Tim Floyd.